PANJIM: Vijay Siwach was crowned champion in the Men’s Singles category of the Gadre Gaspar Dias Open after defeating against Joshua Thampy 6-2,1-6,10-6 in a thrilling match . With the tennis fans gathered on court one, Vijay ran away with the first set 6-2 but could not sustain the momentum and lost the second set 1-6. Joshua looked threatening after taking the second set and pushed Vijay all the way in the deciding third set. The final set went all the way to 10-6 in favor of Vijay as he sealed the victory to claim his first Gadre Gasper Dias Open. The ladies singles category saw Simran Khan take on Asuntha Candice on the main court. All through the tournament Simran had been in sublime form and continued to show the same in the final. Simran Khan raced to a 6-2 win in the first set only for Asuntha to peg her back and win the second set 6-4 to make one set each. 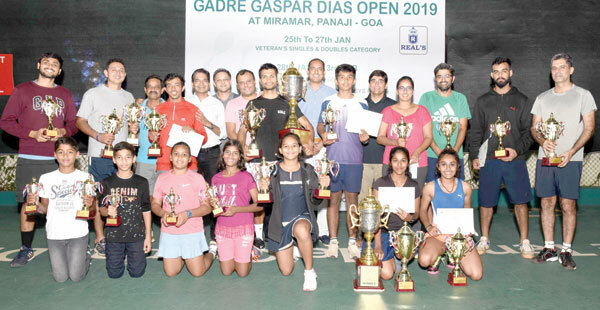 In the deciding super tie breaker, Simran and Asuntha went head to head in their quest for the trophy, at eight point seat game it looked like both players would hold on to their serve but Simran who finally broke the serve and went on to win her fourth Gadre Gaspar Dias Open with 6-2, 4-6, 10-8. In the men’s doubles category the pairing of Rajendra Godinho & Mano Chhabra won over Divij Sharma & Neil Thanawala 7-6; 6-3 in straight sets. Rajendra had a fantastic tournament as he partnered with Saumya to also win the mixed doubles title against Anant & Tashina on Court no.2 (6-3, 6-2). The final of the U-16 Boys category saw Vastav Rivonkar get the better of Saiel Gajinkar 5-7; 6-3; 10-6. Saiel Gajinkar pushed Vastav to the third set but eventually lost out. In the Girls U-16 category, Shayana Mirashi won over Vara Eshwar 2-4; 5-3; 5-4. Shayana also won the Girls U-12 category by defeating Simran Bundela (4-2, 3-5, 5-3). The U-12 boys category saw Saiel Gajinkar and Punit Fadte battle it out for the title with Saiel coming up triumph 4-0,5-4 in straight sets. Nathan Chowgule, President, Goa State Tennis Association (GSTA); Aakash Khaunte, Chairman – Sports Committee, Clube Tennis de Gaspar Dias; Rajesh Khaunte, President, Clube Tennis de Gaspar Dias and Sunil Naik, Secretary, Clube Tennis de Gaspar Dias, gave away the trophies to the winners at the award ceremony.